Wednesdays 5:30 – 6:45 and 7:00 – 8:30. Saturday 10:30-12. Make life easier and sign up here. Receive a deep breath. Notice the sensations in your body. Wherever there is sensation, there is life force. Where there is sensation, there is energy. Often times, the experience of waking up / enlightenment / Samadhi is talked about in very abstract and esoteric terms. A state of bliss so sublime as to be both indescribable and unattainable. In fact, waking up can be as simple as this: noticing the sensations in your body. Noticing that you are noticing. Breathing with intention. Becoming more fully aware of how breath flows through your body and how thoughts flow through your mind and how energies flow through your life. Waking up is tuning in, not tuning out. Checking in instead of checking out. There may be fear that arises with this notion of tuning in. 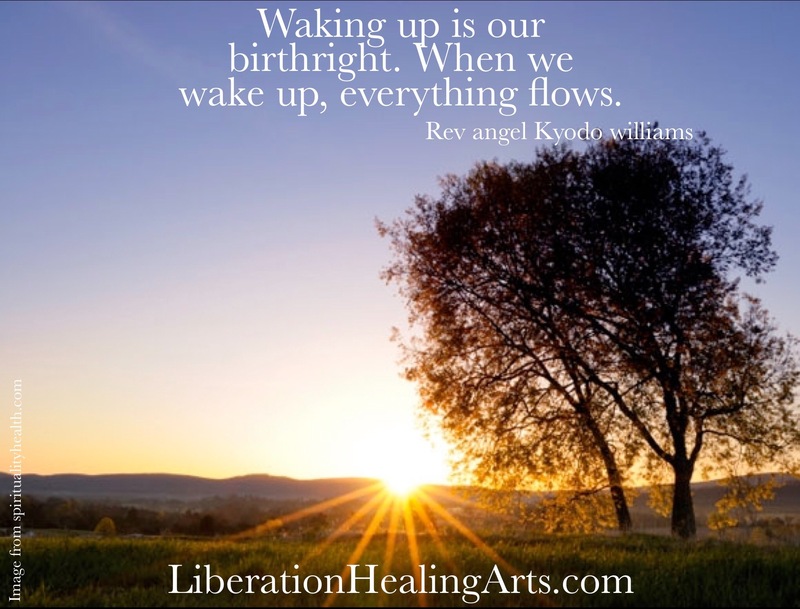 Because in fact, being fully present, tuning in, waking up can open us to a world of pain, previously unattended to pain, long buried pain, or pain we didn’t even know we carried, pain that isn’t even ours but is that of our ancestors, our elders, our kin. For many good and understandable reasons, many of us choose not to wake up. But in choosing not to wake up – whether consciously or unconsciously – we cut ourselves off not only from the pain but also from the power. The fear of waking up, the aversion to connecting fully with the breadth of our emotional, physical, mental and spiritual range of motion / bandwidth, this fear also stops us from fully accessing the very thing that will help us ride the waves of whatever arises. Call it Spirit, Grace, Greater Energy, Shakti, God, Goddess…whatever name you give it (if any at all), this force is nothing less than Unlimited Creative Potential, Complete Freedom, and Infinite Steadiness. It is exactly what we need to navigate the terrain of our lives, relationships, and struggles. And it always available to us, as close as this breath. Receive a deep breath. Notice the sensations in your body. Look for where this energy is revealing itself to you. Wake up to it. This is your birthright. When you wake up to it, everything flows. 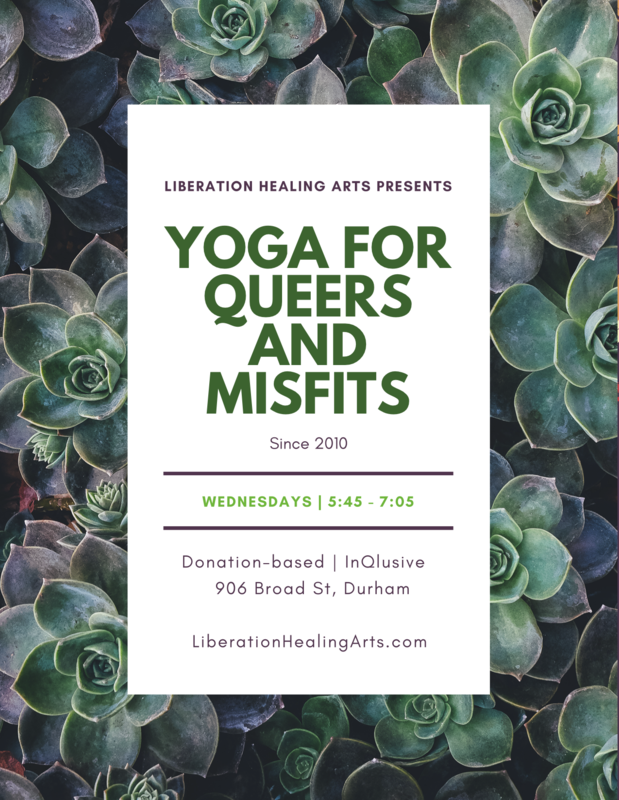 This entry was posted in Uncategorized and tagged all-levels yoga, anti-oppression, community based yoga, durham yoga, durham yoga company, inclusive yoga, patty adams, queer yoga, resilience, reverend angel kyodo williams, self-care, social justice, social justice yoga, trauma-informed yoga, yoga, yoga for queers, yoga in durham. Bookmark the permalink.